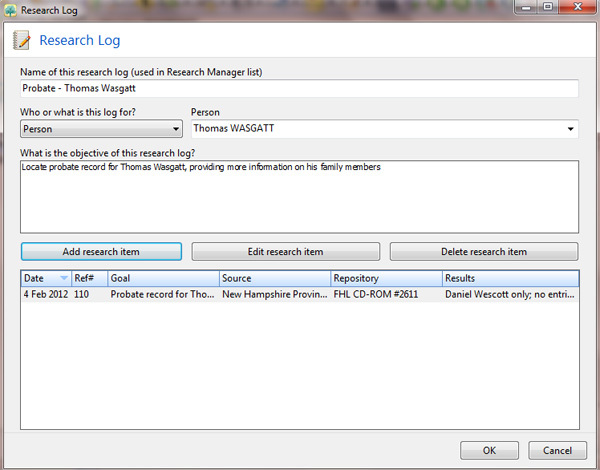 After my first day at the Family History Library, I realized I need a major over-haul of my research log. For quite a while now, I’ve used Excel to plan what materials to research at a repository and updated the spreadsheet with what I’d located. However, I didn’t have a really good way of incorporating that into a research log. However, I think I’ve come up with a system that will work and is relatively simple to use. Above is the spreadsheet that I created before coming to Salt Lake City, listing the various films and books I wished to see for the state of New Hampshire. (I created other worksheets for additional states that I was focusing on.) To utilize this as a tool that can be referenced in RootsMagic 5’s internal research log, I added a column for a reference number on the far left. While this process may take a couple more steps, in the long run it is saving me time, as I know what I’ve checked, and can easily reference these lists when at other repositories. 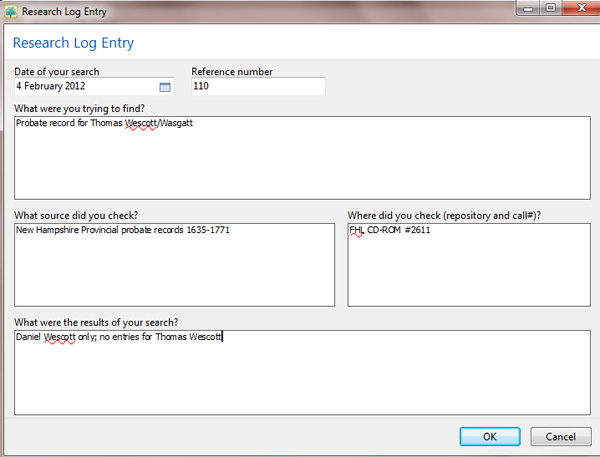 What do you use for your research log? If you are a RootsMagic user, have you started to utilize their tool? This entry was posted on Saturday, February 4th, 2012 at 5:15 PM	and posted in Learning, Research Trips, Technology. You can follow any responses to this entry through the RSS 2.0 feed. « In which I confess my sins – Family History Library fun! How did you link to Evernote from Excel? I’ve never tried that before . . .
Jenny – Log into your Evernote account at Evernote.com, click on the note you wish to link to. 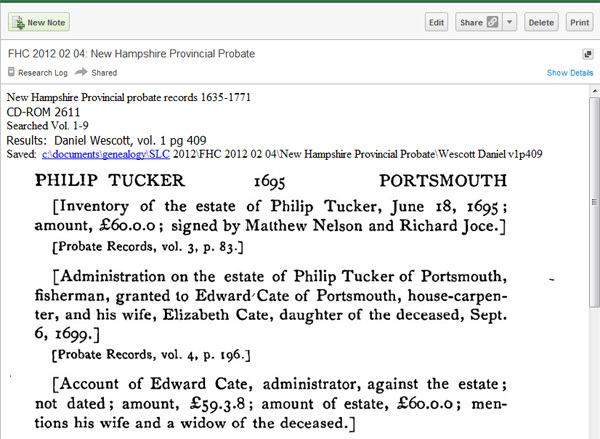 Then, click on the arrow in the upper right hand corner, and select “link” at the bottom of the menu. A popup menu will open showing the URL – click “copy to clip board,” then paste into the appropriate cell in Excel. Does this auto populate your RM5, or do you still manually enter the data into RM? The data does need to be manually entered into RootsMagic.